To meet the heterogeneous demands of applications in the field of Industry 4.0, TSUBAKI KABELSCHLEPP has developed the new MASTER cable carriers LE60/LE80 with the innovative divider system TS3. The reduced wall thickness of the divider system lets customers benefit from more space in the interior: compared to the previous cable carrier, this achieves a space saving of 50 % in the vertical and 37.5 % in the horizontal. At the same time, the new MASTER cable carriers are easy to open and fill, for time-saving harnessing from all sides. “The requirements for dynamic cable routing are becoming increasingly more complex in the age of Industry 4.0. On the one hand, the packaging space in the machines is decreasing, while on the other hand customers want more space inside the cable carrier,” Werner Eul, Product Manager Cable Carrier Systems at TSUBAKI KABELSCHLEPP, explains. “In addition, the cables differ with regard to function, cross section and sheathing material.” The new MASTER cable carriers LE60/LE80 with the newly developed divider system TS3 can fully meet these requirements. The new divider system TS3 combines space-saving, flexible inner distribution with very quick opening. This allows customers to easily keep the necessary overview for installation and harnessing. The matching dividers allow users to always achieve the best possible result with regard to space requirements, systematic placement and ease of assembly. For greatest possible flexibility, all individual components can be combined flexibly and changed or added later on. The particularly space-saving, only 2.5 mm wide height separators are available in 33 different lengths and allow inner distribution across 5 levels, while locking dividers ensure permanently tight seating. Sliding dividers are possible within the chambers with fixed chamber widths from 10 to 108 mm. The complete divider system can be moved and fixed in the cross section. The MASTER series offers quiet and weight-optimised cable carriers with a favorable ratio of inner to outer dimensions. Thanks to the fixable dividers, these are also suitable for arrangements laying on their side and high lateral accelerations. The optimised MASTER cable carrier types LE60 and LE80 feature plastic stays, making this cable carrier available as a full plastic version for the first time. The MASTER cable carriers are available with different bend radii. The UMB end connectors of the MASTER series can be fixed at the bottom, top or front and offer strain relief options with Line-Fix clamps via the integrated C-rail. 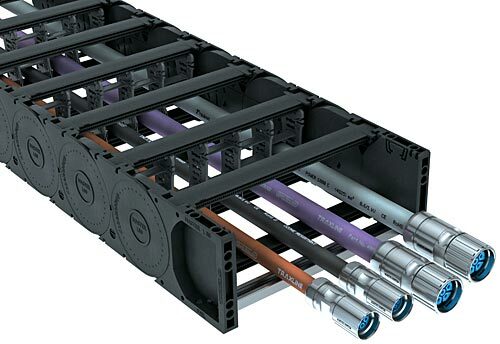 In combination with a support tray or a guide channel as well as the TRAXLINE cables for cable carriers from the product range, the MASTER cable carriers form a ready-to-install system which is also available as a pre-assembled TOTALTRAX complete system including connectors.